Comments - Interesting scene from the play "Keian Taiheiki," a drama about the Keian Uprising in 1651 which attempted to overthrow the Tokugawa Shogunate. 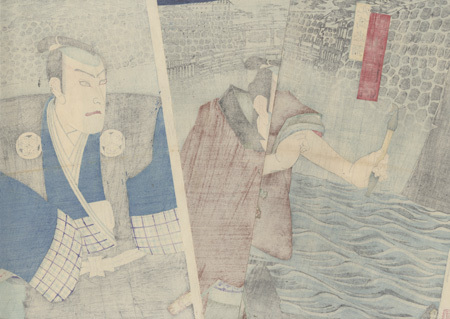 At left, Ichikawa Sadanji plays Marubashi Chuya, a ronin who taught martial arts and co-led the failed coup. 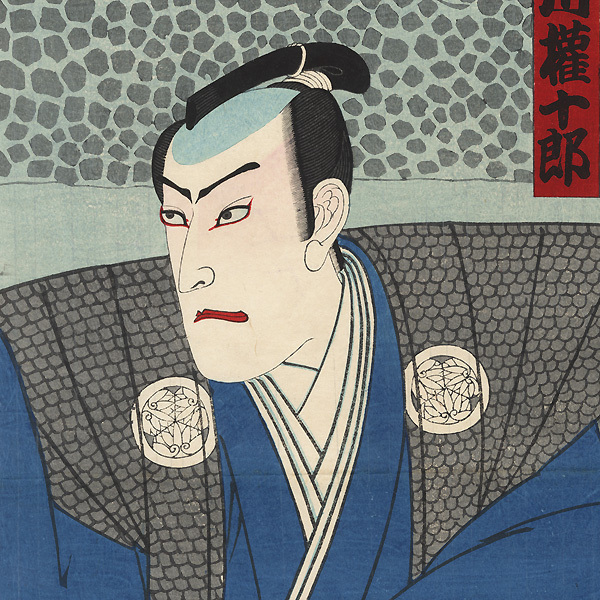 A right, Ichikawa Gonjuro plays the samurai Matsudaira Izu-no-Kami. He carries an umbrella as Chuya makes his way before him along the moat of Edo Castle, carrying his pipe upright, staring ahead with an intent frown. He wears a brown coat over his kimono, which is tucked up for easier movement. Izu-no-Kami wears a formal dotted kamishimo over a blue kimono trimmed with plaid, the shoulders emblazoned with the three hollyhock leaf crest of the Tokugawa clan. Rain falls in delicate lines over the scene, with stone walls of the fortress and bridge over the moat rendered in gray silhouette in the background. A handsome design with large expressive figures, nicely colored and detailed with burnishing in the black collar. Condition - This print with excellent color and detail as shown. Three separate panels. Slight soiling, a few light creases at edges. Please see photos for details. Good overall.